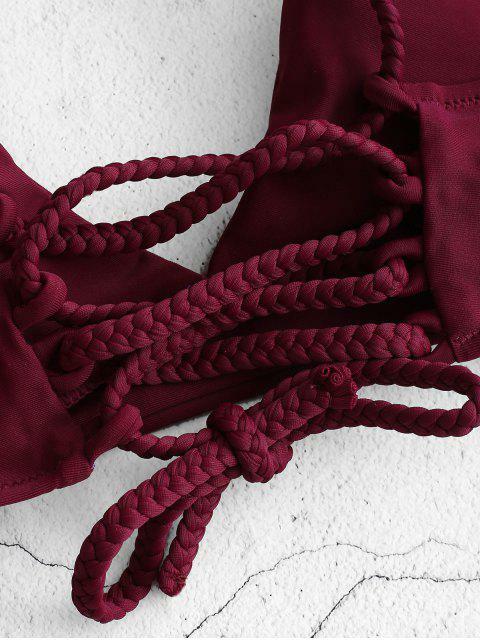 [34% OFF] 2019 ZAFUL Lace-Up Braided Flower Bikini Set In RED WINE | ZAFUL ..
Super cute!! Great material, removable padding in top. Love the sides on the bottoms. Back strings are able to tie so you can make it tight or loose. Exactly like the pictures. I’m 5’2, 118lbs, 34C, size 5 pants US. I got a size Medium and it fits perfect. Love this bikini! I like this swimsuit more than I thought I would! the top fits really well and is flattering. the strappy back is not only cute but also adjustable which is a plus. I'm 5'5 and 125 lbs and I got a medium. Super cute Fits well. I am 5'7 130lbs 34C, I usually wear medium or 7 in bottoms. I bought this in medium. I knew it was cheeky when I bought it, but it's not too bad! I will be buying a lot for like this. Contrast design makes it easy to grab the eyes of this bikini featuring a solid bra with crossing braided lace-up straps to accent the back and the bottom is designed with beautiful flowers and braided ladder straps at side showing much allure.